This event is most often tied to the Breach Inlet Naval Battle and described as one battle since they both occurred on the same day. This Author tends to separate to the engagements since each one included different participants on both sides at different locations. In late January of 1776, British General Sir Henry Clinton sailed from Boston, bound for Cape Fear, North Carolina. John Rutledge, a member of the Continenal Congress, arrived in Charlestown with information of a British move into South Carolina. Named as the newly-appointed President of the General Assembly that remained as the backbone of South Carolina's revoluationary government, President Rutledge organized a defense force under the command of 46-year-old Col. William Moultrie, a former militiaman and Indian fighter. Col. Moultrie saw Sullivan's Island, at the mouth of the entrance to Charlestown Harbor as a good place suited to build a fort to protect the entrance from intruding enemy warships. Sullivan's Island was chosen because at the time because it was a geographic obstacle that shielded the harbor. A large vessel sailing into Charlestown first had to cross Charlestown Bar, a series of submerged sand banks lying about eight miles southeast of the city. Col. Moultrie and his SC 2nd Regiment arrived on the island in March of 1776 and began construction of a fortress to defend the island and channel to Charlestown Harbor. The construction moved slowly in which an observer, Captain Peter Horry, later described the site as a "an immense pen 500 feet long, and 16 feet wide, filled with sand to stop the shot." The workers constructed gun platforms out of two-inch planks and fastened them together with wood spikes. During late May, British frigates arrived to scout the area and observe the construction of the enemy fort on Sullivan's Island. The main British fleet arrived outside of Charlestown Harbor on June 1. Col. Moultrie observed a British scout boat observing possible landing points on nearby Long Island (now called Isle of Palms) just a few hundred yards from Sullivan's Island. Major General Charles Lee, the newly-appointed leader of all Patriot troops in the Southern Theater, arrived a few days later and was put in command of the land forces around Charlestown. On June 8th, after most of the British fleet had crossed the bar and anchored in Five Fathom Hole, General Sir Henry Clinton sent a proclamation to the Patriot rebels to lay down their arms or face military action, which President Rutledge rejected. With the fort on Sullivan's Island only half complete, Vice-Admiral Sir Peter Parker was confident that his warships would quickly blast the fort into pieces. The square-shaped Fort Sullivan made up of only the completed seaward wall, with walls made from Palmetto logs 16-feet wide and filled with sand, which rose ten feet above the wooden platforms for the artillery. A hastily erected palisade of thick planks helped guard the powder magazine and unfinished northern walls. An assortment of thirty-one (31) hard-to-get cannons, ranging from 9- to 12-pounders, as well as a few English 18-pounders and French 26-pounders, dotted the front and rear walls. The British finally attacked on June 28, 1776 - in concert with a naval attack at Breach Inlet. The British attempted an assault from Long Island by landing small boats on the northern end of Sullivan's Island. The attack was covered by an armed British schooner. The boats were turned back when the Americans fired at point-blank range, causing very heavy casualties in the British assault party. With this rebuff, General Clinton called off the attack and no other attempts were made. By 9:30 p.m., all firing ceased. At 11:30 p.m., the British ships withdrew to Five Fathom Hole. With their efforts repulsed at both ends of the island, the British halted their attack late in the day. Still, they had a major problem. Of the three ships which had run aground, the HMS Acteon was still unable to extract herself, despite the best efforts of her crew. The captain requested Vice-Admiral Parker's permission to abandon ship, and destroy her to keep the ship from falling into the hands of the Americans. This was received and the captain set ablaze one of the British Navy's finest ships, commissioned less than a year before. An American salvage party went out after it was abandoned and was able to gather the ship's bell, the colors, and various stores before the spreading fire endangered their safety. Half an hour later, the ship's magazine exploded. The results of the victory were many-fold. For the Patriots, it was their first decisive victory. 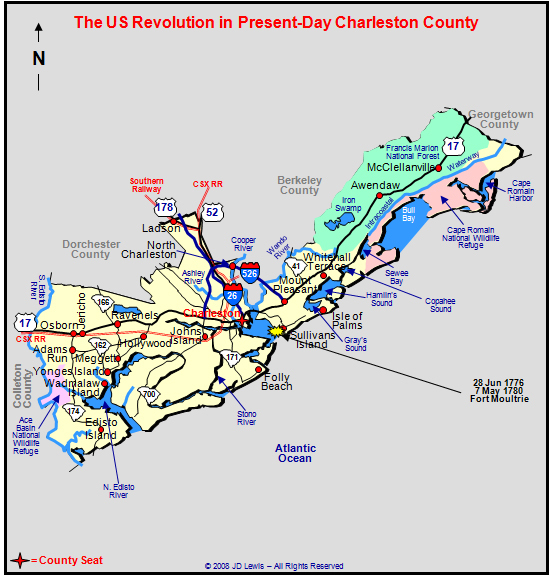 For South Carolina, it produced a confidence in the government led by President John Rutledge and forestalled another British effort to take Charlestown for over three years. More importantly to both South Carolina and the new nation, this daring feat against large odds fired the imagination of its citizens. Here was the model for future triumph. It was here, in a day-long battle, that a gallant and spirited band defeated in desparate conflict an overwhelming naval and military force and having utterly whipped them, drove them from their shores. For the new nation, pride in the victory was unbounded. For the British, the results were humiliating. A superb naval flotilla and army had been thwarted, in a large degree, due to the imprudent mistakes made by veteran officers. Poor planning and the refusal of the army and navy to cooperate sealed the doom of the British. The British lost all element of surprise and failed to take advantage of American weaknesses in early June of 1776. There were no naval officers in the fleet familiar with Charlestown harbor. Instead, Vice-Admiral Parker relied on impressed pilots to guide the ships to their crucial anchorage. The British did not attempt to renew the battle or try to take the fort again this year, and by mid-August, the fleet withdrew northward to help the main British army in the campaign against New York. Within days of the battle, South Carolinians learned of the signing of the Declartion of Independence in Philadelphia, which was a sign of their capacity to oppose British arms. The victory on June 28th stood to them as their own phsycial Declaration, which the upsetting of the British plans in the southern colonies helped win uncommited Americans to the struggle for independence from Great Britain. It also enabled the Southern colonies to support vital campaigns in the north. Most importantly, the victory at Fort Moultrie helped keep Charlestown free from British occupation for more than three years. Click Here for a sketch of the plan of attack on Sullivan's Island by a British artillery officer. Charles Town District Regiment - 6th Independent SC Artillery Company, led by Capt. Thomas Grimball with 100 men and 12 guns. - Capt. William Byers, Sr.
Frigate Prosper - Capt. "Unknown" - no guns. Robert Black was mortally wounded in this battle and he died later on July 11th. HMS Frigate Solebay - Capt. Thomas Symonds with 28 guns.